RIVERSIDE, Calif. -- Worry - it does a body good. And, the mind as well. A new paper by Kate Sweeny, psychology professor at the University of California, Riverside, argues there's an upside to worrying. "Despite its negative reputation, not all worry is destructive or even futile," Sweeny said. "It has motivational benefits, and it acts as an emotional buffer." In her latest article, "The Surprising Upsides of Worry," published in Social and Personality Psychology Compass, Sweeny breaks down the role of worry in motivating preventive and protective behavior, and how it leads people to avoid unpleasant events. Sweeny finds worry is associated with recovery from traumatic events, adaptive preparation and planning, recovery from depression, and partaking in activities that promote health, and prevent illness. Furthermore, people who report greater worry may perform better -- in school or at the workplace -- seek more information in response to stressful events, and engage in more successful problem solving. The motivational power of worry has been studied and linked to preventive health behavior, like seatbelt use. In a nationally representative sample of Americans, feelings of worry about skin cancer predicted sunscreen use. And participants who reported higher levels of cancer-related worries also conducted breast self-examinations, underwent regular mammograms, and sought clinical breast examinations. "Interestingly enough, there are examples of a more nuanced relationship between worry and preventive behavior as well," Sweeny said. "Women who reported moderate amounts of worry, compared to women reporting relatively low or high levels of worry, are more likely to get screened for cancer. It seems that both too much and too little worry can interfere with motivation, but the right amount of worry can motivate without paralyzing." In the paper, Sweeny noted three explanations for worry's motivating effects. 1. Worry serves as a cue that the situation is serious and requires action. People use their emotions as a source of information when making judgements and decisions. 2. Worrying about a stressor keeps the stressor at the front of one's mind and prompts people toward action. 3. The unpleasant feeling of worry motivates people to find ways to reduce their worry. "Even in circumstances when efforts to prevent undesirable outcomes are futile, worry can motivate proactive efforts to assemble a ready-made set of responses in the case of bad news," Sweeny said. "In this instance, worrying pays off because one is actively thinking of a 'plan B.'" Worry can also benefit one's emotional state by serving as an emotional bench-mark. Compared to the state of worry, any other feeling is pleasurable by contrast. In other words, the pleasure that comes from a good experience is heightened if preceded by a bad experience. "If people's feelings of worry over a future outcome are sufficiently intense and unpleasant, their emotional response to the outcome they ultimately experience will seem more pleasurable in comparison to their previous, worried state," Sweeny said. Research on bracing for the worst provides indirect evidence for the role of worry as an emotional buffer, according to Sweeny. As people brace for the worst, they embrace a pessimistic outlook to mitigate potential disappointment, boosting excitement if the news is good. Therefore, both bracing and worrying have an emotional payoff following the moment of truth. "Extreme levels of worry are harmful to one's health. I do not intend to advocate for excessive worrying. Instead, I hope to provide reassurance to the helpless worrier - planning and preventive action is not a bad thing," Sweeny said. "Worrying the right amount is far better than not worrying at all." 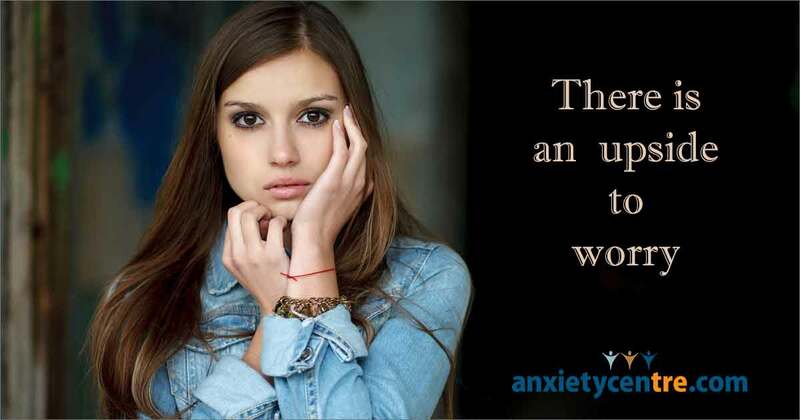 anxietycentre.com: Information, support, and coaching/counseling/therapy for problematic anxiety and its sensations and symptoms, including the latest in anxiety research, There Is An Upside To Worry.